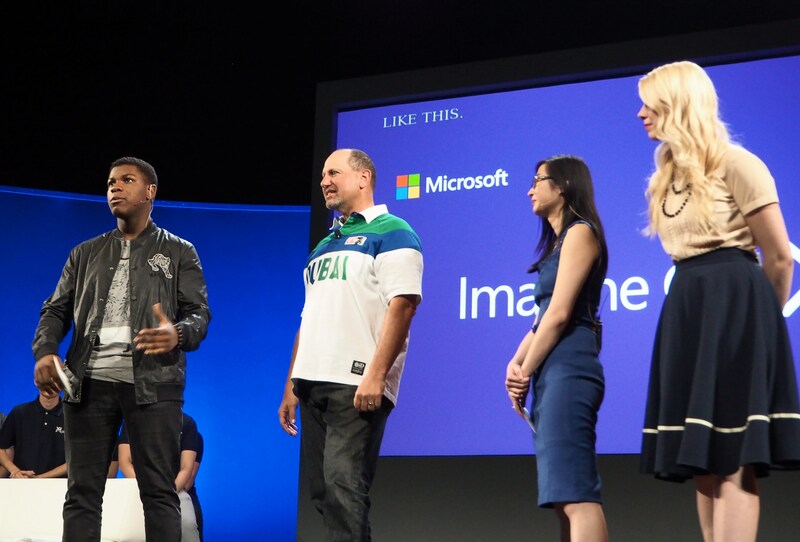 After the conclusion of Microsoft’s Imagine Cup, I got a chance to talk to John Boyega, of Star Wars and Attack the Block fame — and erstwhile competition judge. We chatted about his relationship with technology, what he’d like to see people create, and yes, Pokemon Go. First of all, you ever make anything like what these kids made? I mean, I’m outside it, but I see that these guys have to go through serious things that challenge their minds and brains, to create something to works, that changes things. And the market is tricky, but these kids are really thinking. They’re on a good level. Did you grow up with a lot of technology? I grew up around a lot of technology, I just couldn’t afford it! I bought my own first game console when I was 17. So, you know, technology was around me, but we kept it classic for a bit. Yeah, you know, this [i.e. the venue] is actually my old high school, and it was falling apart then. We didn’t have anything. That’s what always happens isn’t it? When you’re at the school it’s like [he looks around disgustedly], but you go back, the drama class has a sound system, lights and all that stuff. It’s good, though. For you personally, like on set, is there any tech you’d like to see someone really improve? For me, something that’s interesting is the technology of pre-vis. Right now we’re at a good point where we can have an actor in a scene with a green screen, and probably like a physical representation of a beast or creature with pinpoints for mocap — that can then go onto a computer in a second and you can actually watch the shot as it would be on the screen. But it’s rough pre-vis, and I would love to see that with a little bit more accuracy to what you would have at the end. Globally do you think there are issues technology could be addressing? The first idea that comes to mind is people that live in very remote areas and villages in 3rd world countries, who go through sicknesses and disease — there needs to be a way that we teach these guys the basics of those symptoms and what they mean. I don’t know, like phone software that can be reachable for these people, something simple, kind of like a Nokia 5210 that gives them access to emergency help lines and such. Because they’re detached from that experience, the luxury of having an ambulance to come get you. So a way of merging those two worlds would be fab, without those people, obviously, having to spend 500 dollars on an iPhone. That would be great. You mentioned bullying on stage, and we see a lot of it on Twitter, on Instagram — do you think there will be a solution from those companies to crack down on it? Oh, yeah. Officially they should. Especially with the trolling Twitter accounts and Instagram accounts that we have. Recently Instagram did send an email to everyone on the network that they would be deleting thousands and thousands of troll accounts, but at the same time their basis for that was interesting to me. How can you tell? Like if someone has 500 followers versus 328, does that make a difference? You can just build up followers like that on Instagram anyway. But it’ll be interesting to see what they do. And bullying comes in all different forms, and people show it in different ways when they’re the victim. Did you study nerdy stuff in school, or were you pursuing acting, or what? When I was in secondary school — which obviously is high school for you guys — acting wasn’t something I was interested in on an educational curriculum level. Because for me it’s not academic, it’s spiritual, it’s character, it’s human. But I was always interested in science, particularly biology. Mathematics… we had a love/hate relationship. Anything you’re looking forward to now in particular in the tech world? I’m looking forward to seeing new ideas. I think we’re coming to a point where the numbers and the business platforms are taking precedence over what we actually need. We’re kind of being overfed. It’s great to have new ideas, fresh ideas, that’s why Imagine Cup is so important. It’s nice that Microsoft is looking at the younger generation and care about their ideas, and they’re helping them further themselves as individuals. Like you said before, the way we relate to technology now is unique… Are you playing Pokémon GO? I do have the app. Currently at level 5, CP levels are looking good. I found a Pikachu at Pinewood Studios while filming Star Wars . I told EVERYBODY. “I got a Pikachu!” I was the most popular kid on set for like a day. I was in Boston a few days ago and I thought there was like a fight going on, there were so many people crowding… I was like, what’s going on ? Oh, they’re just playing Pokemon. It’s great the ways technology has brought us all together. It’s a very interesting time.